The Map window in WhatRoute is used to plot routes and flows on a map of the world. Open the Map by using the Window/Map menu. WhatRoute will remember the position and size of the Map window and will reopen it next time you start the application. A button to open layout and display settings for the map. A control to enable the use of Apple Location Services to accurately determine your current location. A quick access dropdown menu to change map settings. A text field (title) showing the current source of flow data. The 2 character ISO country code of the country nearest the cursor. A button to display the selected region of the map in a more detailed view. If you click a node shown on the map, details of networks currently terminating at the node will be displayed in a popup window. If you click on the map and drag, an area will be highlighted with dashed lines. The View/Show detailed selection menu item (also available in the quick access menu) may then be used to display the highlighted area in a detailed map view. Any networks terminating in the selected region will also be shown as red pins. The selection region may be cleared by clicking in an empty part of the map. Routes and flow paths displayed on the map will be transferred to the detailed map view. On the detailed map, pins are used to display network nodes. Click on a pin to discover more information about the node. 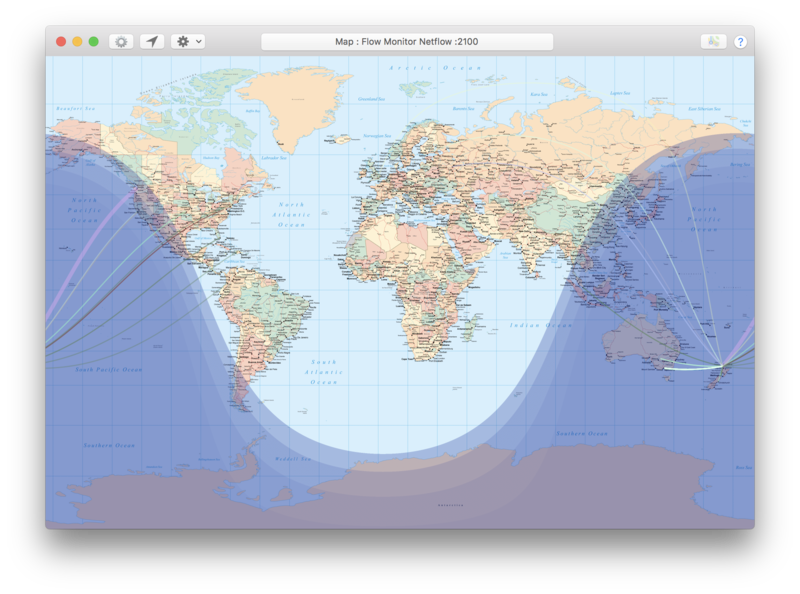 Lines from New Zealand (where I live) to other points on the planet. These lines represent network flows between my computer and hosts and the remote locations. The lines are curved because the shortest distance between two points on the surface of a sphere is a great circle. On a 2D map using the Mercator projection, these circle arcs become curves. The lines are of different colours. WhatRoute can be configured to represent different network protocols by different colours on the map. Some lines are brighter than others. This is because WhatRoute can fade the line as it ages (i.e. since activity was last detected on the flow). Fading is enabled/disabled via the quick access dropdown menu or in the map settings. Whats with the crop circles? The circles represent the range of accuracy in the location provided from the geoserver engine. These circles are distorted by the Mercator projection although in general their radius is too small for that effect to be easily seen. As you hover the mouse over the centre of one of the circles, you will see the mouse pointer change to a +. If you click at that point, a dialog will appear showing detail of the networks that have been determined to be near that location. When you click Show detail in the dialog, Apple Maps (or your preferred viewer) will be invoked to show a more detailed view of that point. You can optionally display the place regions, used by WhatRoute to more quickly determine the location of the place nearest to the mouse pointer. The name of the nearest place is displayed in the top right corner of the map. The place regions are 5 degrees on each side. When searching for the nearest place, WhatRoute first looks in the region under the mouse pointer and its 8 immediate neighbours. If no places are found (i.e your mouse is over the middle of a large empty area) then all regions are searched. Places are cached. You can clear the cache in View/Show Inspector window. Show or hide night time with Night region in the action menu. The bands in the night region represent the twilight zones - civil, nautical and astronomical. Display of the twilight zones can be enabled or disabled in the map settings.